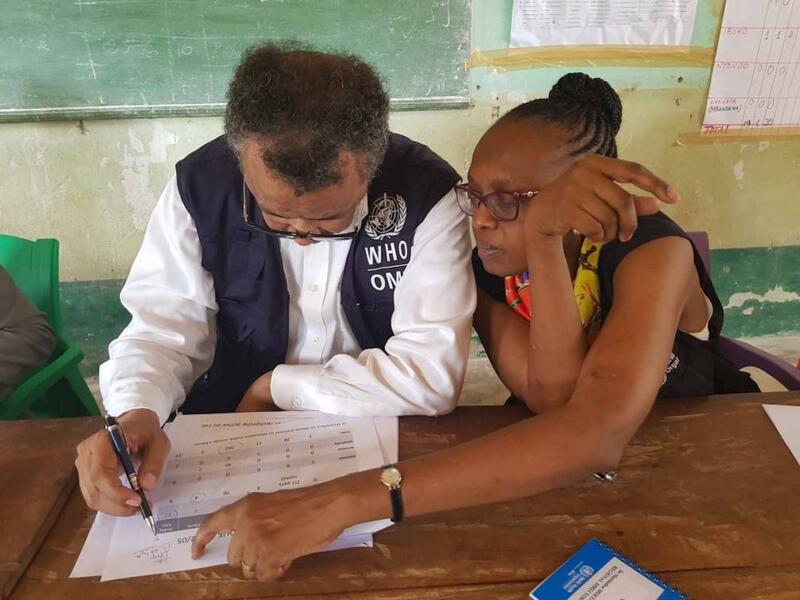 13 May 2018, Kinshasa - World Health Organization (WHO) Director-General Dr Tedros Adhanom Ghebreyesus today visited the town of Bikoro in the north-west of the Democratic Republic of the Congo to assess the response to the current Ebola outbreak. WHO is deploying experts and coordinating partners as well as providing supplies and equipment to provide life-saving care and support infection prevention and control. WHO is working with the Ministry of Health to gather and test samples, conduct contact tracing and improve data collection and management. They are conducting a retrospective analysis of the chain of transmission to better understand the outbreak. Earlier in the day, Dr Tedros met with the President of DR Congo, Mr Joseph Kabila and the Minister of Health Dr Oly Ilunga Kalenga to review the steps taken so far and agree the way forward. Dr Tedros led a WHO delegation that included, among others, Dr Matshidiso Moeti, WHO Regional Director for Africa, and Dr Peter Salama, WHO Deputy Director-General, Emergency Preparedness and Response. Bikoro health zone is nearly 150 km from Mbandaka, capital of Equateur Province in an area of the country that is very hard to reach. The World Food Programme (WFP) has assisted WHO in putting in place an air-bridge between Kinshasa, Mbandaka and affected areas, with flights six days a week to deliver supplies and personnel. As of today, a total of 39 Ebola cases have been reported in the area in the past five weeks, including 2 confirmed, 20 probable (including 18 deaths), and 17 suspected. WHO is working with the Government and key partners – including Médecins Sans Frontières, WFP, the International Federation of the Red Cross and Red Crescent Societies, UNICEF, UNOCHA, MONUSCO, IOM, Africa CDC and US-CDC – to strengthen coordination of the Ebola response at the national level and in the affected Bikoro health zone. WHO is calling on development partners to ensure a strong, comprehensive and rapid response to support the DRC Government to prevent and control the spreading of the disease. WHO released US$ 2.6 million from its Contingency Fund for Emergencies to kick-start the rapid response. Based on current assessment and response needs the estimated budget for the international response is US$ 18 million for a 3-month operation. The Wellcome Trust and UK Department for International Development (DFID) have announced a commitment of up to £3 million to support a rapid response to the outbreak.